Over the years I have purchased most of the different Dining Plans available at Walt Disney World Resort (“WDW”). I prefer to purchase the Dining Plans because I like to have my costs figured out ahead of time and I don’t want to think about how much I’m spending on each meal. The great thing about the Dining Plans are all the choices available depending on what style of restaurant you prefer and how many meals a day you want to eat. With all the different Disney Dining Plans available at WDW the one that I seem to keep returning to is the Quick-Service Dining Plan. This plan consists of two Quick-Service meals and one snack each day. Now some people have told me I’m crazy to want to eat “fast food” for an entire week but these are the people who don’t understand the vast array of options available for Quick-Service at WDW. I’ve spent entire weeks at WDW and never eaten a single hamburger, which truly amazes some people. 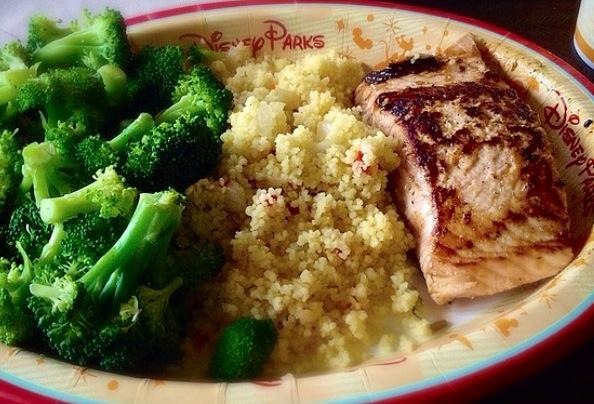 Quick-Service at WDW basically means you eat cafeteria style instead of being waited on. It has nothing to do with the quality of the food or options offered. Photo courtesy of Mary Morales of Disney Food Fans Group on FB. 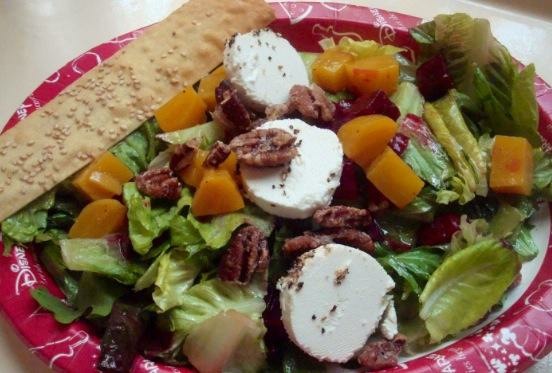 Beet and Goat Cheese Salad from Sunshine Seasons. All this choice and no need to figure out and book reservations months ahead of time is why I keep returning to the Quick-Service Dining Plan. Don’t get me wrong the Table-Service restaurants are fabulous too but after having purchased the Deluxe Dining Plan a few years ago and booking reservations for breakfast, lunch and dinner each day for a week, it felt like all my family did was run from reservation to reservation. There was no spontaneity and it was far too scheduled. With the Quick-Service restaurants you just stop to eat when you are hungry and see something on the menu that looks appealing to you at that moment. No planning needed. I still book the occasional Table-Service restaurant for special occasions but am more than happy with the less expensive Quick-Service options and I don’t hesitate to recommend them to anyone who asks. We rarely eat at table service restaurants and I have never had a burger at WDW. I have tried each dish you mention, except Yak and Yeti. They are all tasty and “reasonably” priced. I know, there are so many tasty options. It amazes me that people still think you will end up eating burgers and hot dogs all week.